A steadily increasing global population, growing food demand, and changing climate necessitate new kinds of thinking in agriculture but also fields like public health and energy, concludes a new book, Hot, Hungry Planet, by former Wilson Center Public Policy Scholar and current Senior Fellow at the National Socio-Environmental Synthesis Center Lisa Palmer. Palmer has written about sustainability and the environment for the better part of two decades, but began working on what it all means for policy during her time at the Wilson Center. Later, she took trips to Asia, Africa, Latin America, the Middle East, and across the United States to talk to those affected by global food, climate, and population dynamics. The book focuses on three ways to support food security and climate resilience in a changing world: social, educational, and agricultural advances; land use changes and technical actions by farmers; and policy “nudges” that could reduce adverse environmental impacts of agriculture while providing enough to feed the 9.7 billion people expected in the world by 2050. In Ethiopia, a growing population is projected to exceed 171 million people by 2050, and the country’s vulnerability to extreme weather, such as drought and rising temperatures, is prompting concerns of food insecurity. How will we feed 9.7 billion people? 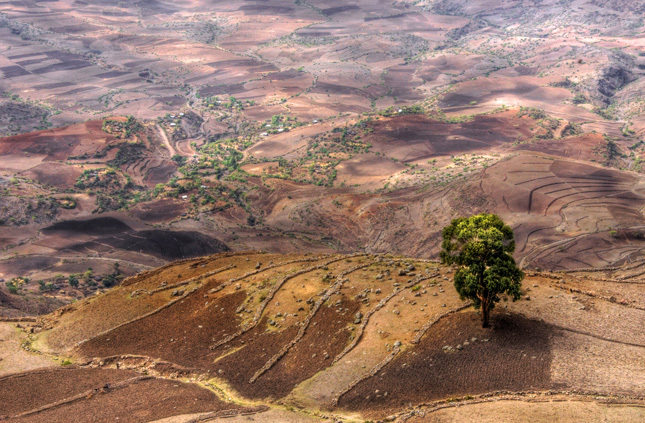 A 2010 World Bank study showed that agriculture accounts for nearly half of Ethiopia’s gross domestic product, including almost 90 percent of its exports and over 80 percent of total employment. Channing Arndt, a senior research fellow at the International Food Policy Research Institute, described sub-Saharan Africa as “the epicenter of the development challenge.” Of the 2.4 billion people projected to come into the planet by 2050, half of them are expected to be in sub-Saharan Africa, he explained. And as population and incomes increase, so will demand for food. Food is already a primary source of natural resource consumption, Arndt said, and other factors, such as transportation and energy use related to food production, must also be considered in its impact. The 27 low-income countries located in Africa are structural importers of fuel in large part due to the high energy intensity of their agricultural sectors, for example, Arndt explained. Palmer talks about one example in the book where she looked at adaptive measures being carried out at roughly 80 “climate-smart villages” across six Indian states. In the village of Dhundi, farmers were irrigating crops using solar pumps, which not only provide cheaper, cleaner energy than diesel pumps, but also provide financial incentives to conserve water because farmers can sell excess energy back to the grid. “I tried to show the areas that are working towards solutions and create some of these hopeful pictures of the world we want to live in, but also a world where we may need to work a little bit harder,” Palmer said. “The good news is that there is quite a lot of scope to sustainably increase food production,” Arndt said, especially in developing countries. But solutions will not be easy – or fast. Smarter agriculture that is both higher in productivity and more environmentally sound requires higher levels of education, he said, and efforts to improve these systems take time to implement and see the results of. To formulate and encourage meaningful progress, Nabeeha Kazi, president and CEO of the development consulting firm, Humanitas Global Development, urged policymakers to consider an integrated approach to climate change mitigation, one that not only protects, but builds the resilience of communities and takes advantage of opportunities for positive change. “We can’t be prescriptive and sit here and force feed what we think is right,” said Kazi. “We really have to have a lot of options on the table and co-create a response with governments, and communities, and with farmers based on what their needs are.” Large-scale agriculture, for example, despite its unpopularity among some green advocates, should not be “demonized,” she said, as we cannot meet global food demands by relying solely on non-industrial sources. Sources: United Nations, World Bank.